Despite sore muscles from the previous two trips up the mast this week, I couldn’t resist Doing the Inchworm again on this beautiful still and sun soaked day. 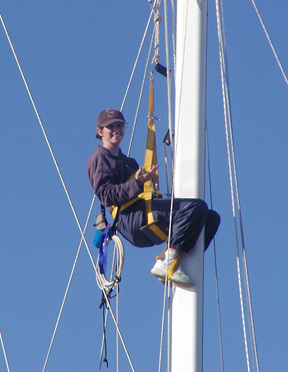 The sail halyards have been rethreaded and now roll smooth and strong. The burgee halyards are replaced and Larry’s mermaid flag is at half mast to mark the anniversary of his death. Amazing, it’s been a whole year since my dear friend left the planet with no notice and no forwarding address. Feels like yesterday. I find that I can find the strength and energy to do hard stuff when it is “to make Larry proud.” There’s no shortage of ways to trick the old brain into action. Are you watching up there Larry? Look for my Granny who arrived in June and is 100 years old going on 16. She’s probably hit on you already. And be kind to Marty who is new to this whole non-corporeal deal and is probably wondering what he is supposed to be doing now. Join the club. This entry was posted on Friday, January 21st, 2011 at 5:45 pm and is filed under Boat Improvements and Uncategorized. You can feed this entry. You can leave a response, or trackback from your own site.